Renting a roll off dumpster in East Greenbush and the surrounding Rensselaer county towns and village is easy. We will drop off a small to medium sized dumpster at your home. Affordable Dumpsters is here to help and we are more than happy to help you make it easy to rent a dumpster, and this article explains how you may clean up your home or property using one of our dumpsters. You may call us at 518-369-1223 for a dumpster rental in East Greenbush or fill out our online form to rent a dumpster. We will give you everything you need when you contact us, and you will keep your space far cleaner as a result. ​What Sort Of Dumpster Do You Need? ​We have 6 to14 cubic foot dumpsters available that will work on your property no matter what kind of junk you are getting rid of, and we have many satisfied customers who find it easy to clean up their space using our services. Our driveway friendly placement method will ensure there is no residual damage to your property. An Affordable Dumpster is easy to use because it is a walk in container which lifting heavy objects overhead. We are able to remove the rental container fully loaded without incident when it is time to take it away. 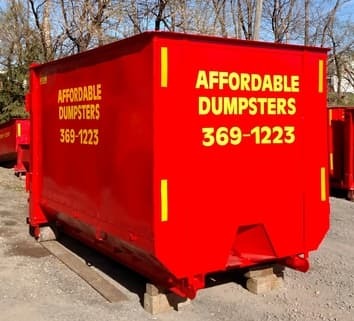 We can assure you that you will not find better dumpster rental pricing anywhere else in East Greenbush New York or Rensselaer County and we will help you save money by making sure that you choose just the right size dumpster for your cleanup project. If you think you need a dumpster larger than 14 cubic feet, let us know. Most times we can place or rotate 2 smaller dumpsters at a cheaper price than some larger competitors like County Waste or Jim’s Roll Off and you will still get the best possible customer service. We accept all major credit cards so why not get your clean up started today. Affordable Dumpsters can rent you a trash container for as long as you need it. We can tailor the rental period to your needs. It doesn’t not matter if you need the dumpster in place for a day, a week, or a month, we will work with you to ensure the arrangement is convenient for you. You can call us to extend your rental, or we will pick up the dumpster early with just a call to our customer service support manager. ​Affordable Dumpster’s offers finest customer service in the industry, and we will give you information that will help you save money on each dumpster rental. We know that if you are a first time renter, you may have a number of questions about hiring a dumpster, and we are more than happy help you sort through all the things you need to know about roll off container rental. Our customer service team is available from 7AM to 7PM, and we will answer your questions and schedule your dumpster delivery when you are ready. Affordable Dumpsters has years of experience in the trash hauling and junk removal industry, and we have built a business with a strong reputation. If you sine in East Greenbush, Schodack, Rensselaer, or any place else in Rensselaer County, call us today or complete our handy online contact form. We look forward to serving you soon!